This page is currently under construction please be patient. If you have a clip you want shown feel free to email it to me with a description and I will add it asap. 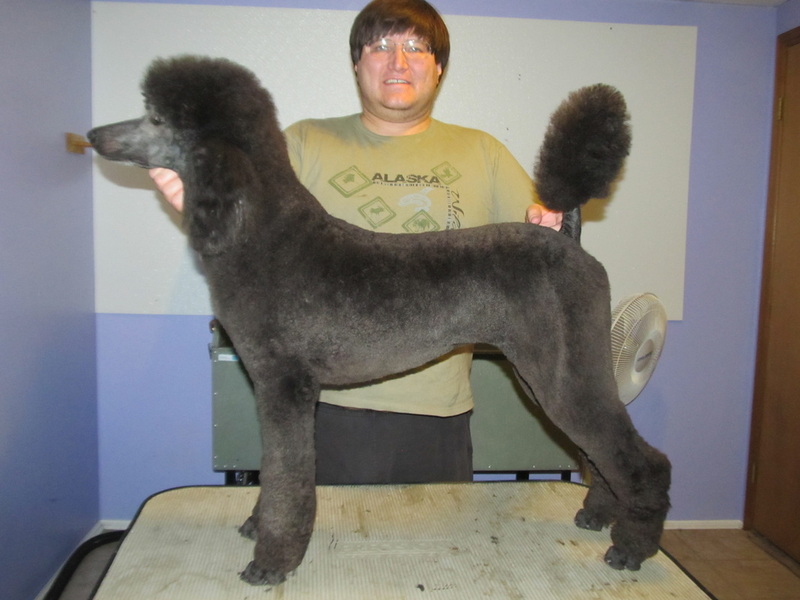 I made this site to show some of the various clips and cuts that poodles can be put in. Of course you are not limited to these cuts or any others the possibilities are endless. 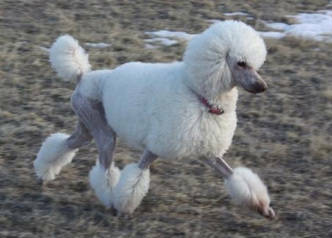 Which is one of the Joys of owning a poodle with their versatile coats. Note that some of these pictures are the same dog in different cuts. So you can see how just the clip can change the entire appearance of a dog. Clean Face- the muzzle and side a face from the corner of the eye to the ear canal, down to the Adams apple of the throat at an angle to a point. Topknot- The hair on the top of the head. Round Face- a muzzle that is not shaved short but has hair left on it of various lengths depending on personal wishes. Usually blended into the topknot and rest of the head. Round Feet- Feet that are not shaved but are usually left the same length as the legs and shaped. 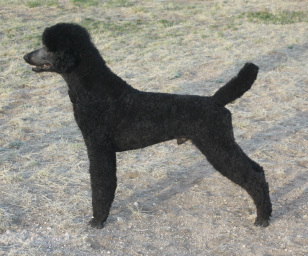 The Traditional Continental- one of the two cuts that a adult poodle over one year of must be in to show AKC breed ring. 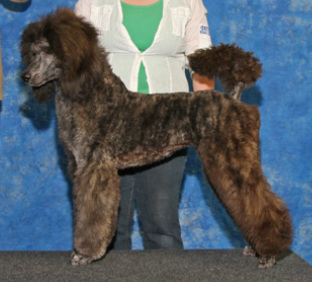 He does not have the full neck and topknot hair seen in the AKC ring. The HCC or the Historically Correct Continental is a variation to The traditional Continental being a shorted and more easily managed version on this cut. The hip poms are optional. 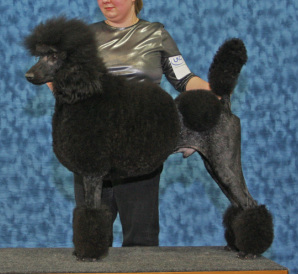 The traditional show puppy cut that a poodle puppy must be in to be shown AKC. 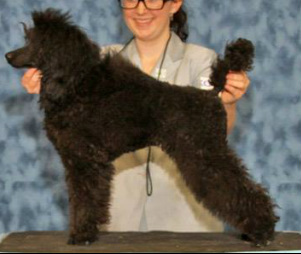 This is an 8 month old mini poodle being shown in UKC so no Hair Spray. Short one length all over cut- I did not do clean feet of face on him just simply took the same blade all over everything. This cut is in-between a modern and a traditional puppy cut I left the topknot and ears natural and did a tight cut on the body with full shaped legs and tail. This miniature is shown in a modified Lamb one length all over the body, with fuller legs, clean face and feet, short ears and a Mohawk. 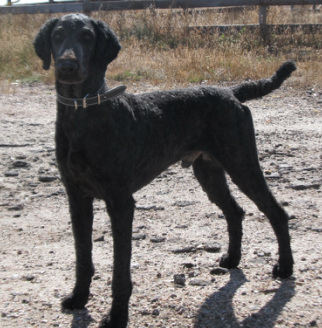 The pet puppy cut- is not a length it is a style. 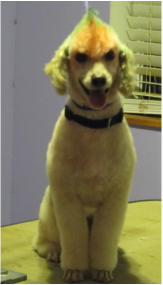 For a poodle it means one length all over the body, with clean face and feet, pom on the tail, ears trimmed to the length the owner wants or left natural and a topknot to balance the body and tail.